That man ... Johnathan Thurston in action during the NRL Grand Final between the Brisbane Broncos and the North Queensland Cowboys at ANZ Stadium. Photo: AAP Image/Dean Lewins. PLAYERS and coaches will say tomorrow night's NRL grand final re-match between North Queensland and Brisbane at a packed-out Suncorp Stadium is a round-four clash worth two competition points. The reality is, it is anything but "just another game". 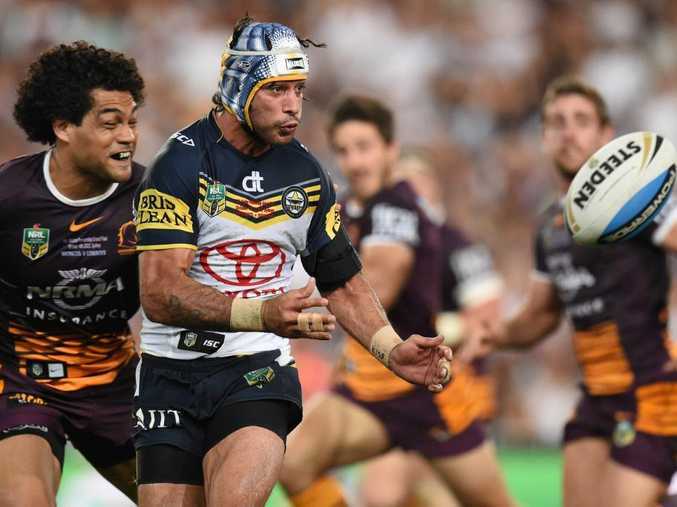 "It's just another game but both teams have circled it on the calendar," said Cowboys playmaker Johnathan Thurston. "You can't but get caught up in the hype, but we're all experienced enough not to let it get in the way." The pain of losing the biggest game of the year last October in golden point, and the way it was lost, still burns deep within every Broncos player. For some it's deeper than others, and that will come out in the Good Friday blockbuster which is sure to have fans on the edge of their seats for much of the 80 minutes - unless this one also goes into golden point, which is not beyond the realms of possibility. Brisbane had the club's seventh grand final "almost" won until Cowboys five-eighth Michael Morgan's sleight-of-hand pass to big winger Kyle Feldt in the dying seconds. The Cowboys have named their 17 grand final heroes for the re-match, while the Broncos have made a few changes with both Corey Oates (shoulder) and Jack Reed (eye) replaced by Lachlan Maranta and Jordan Kahu. Former Brisbane premiership-winning captain Darren Lockyer said it was important players from both sides didn't get over emotional, or build the game up too much, but he admitted it was a match Brisbane would want to win badly. "For the Brisbane boys who were part of the grand final loss it is an opportunity for them to try and extract some revenge, but it is still a round-four game worth two points and you don't want to get too emotional," Lockyer told Australian Regional Media.